... the country’s power sector is prepping for a dramatic increase in U.S. demand for clean electricity. Action on climate change is the reason — more specifically, U.S. President Barack Obama’s Clean Power Plan, which aims to slash carbon dioxide emissions from power plants by a third by 2030. The plan is expected to triple the flow of Canadian electricity into Midwestern and northeastern border states, part of a broader U.S. effort to comply with the international climate obligations that 196 countries agreed to in Paris. The North American Electric Reliability Corporation [NERC], which monitors and regulates grid stability in Canada and the U.S., estimated in a report last April that net Canadian electricity exports under the Clean Power Plan could grow three-fold between 2020 and 2030 as demand for renewable power grows in states such as Ohio, Michigan, New York and jurisdictions in New England. Here we have the agreement from Paris and the U.S. Clean Power Plan discussed, so I'll briefly discuss each to communicate the value for Canada, and particularly Ontario, is limited - but an opportunity does exist. That "name and shame" strategy was advanced in Paris, primarily because the President lacked the ability to have Congress pass anything legally binding. Countries provide plans for reducing emissions, and if they don't achieve them they will be mocked by countries that are achieving their goals, should there be any. The U.S. Clean Power Plan, if it gets enacted, will offer states a couple of methods to comply with individual emissions targets based on a subset of generators operating in the states in 2012 (I'd need to check in the volumes of text to confirm the base year) - the subset exclude generators without emissions in service prior to 2013 (most notably nuclear); it therefore basically includes almost exclusively emitting facilities. States can target either emissions intensity, getting facilities to an average of ~20% below the intensity level of the 2012 base year (so replace coal with gas, of augment coal with wind, etc. ), or they can just reduce their emissions by the requisite amount (it varies by state). Those sound the same, but the first option could actually see increased emissions. Illinois, for instance, could likely replace older nuclear units with natural gas generators and easily meet clean power plan targets by doing so. Emissions reductions can come in state or not - by power purchase agreements with facilities outside of the state, or through the trading of cap space (such as through clean energy certificates). How does this impact Ontario? "Canada exports three times more power to the United States, mainly NPCC and MISO North." NPCC is the Northeast Power Coordinating Council and it includes Canadian provinces/systems east of Manitoba as well as the New England and New York system operator areas (NYISO and ISONE). The "MW Interchanges No CPP" indicates, for Canada, net exports of 5,461 megawatts on average if the Clean Power Plan doesn't come into force, which works out to an annual total of about 48 terawatt-hours (TWh), and that is the average that actually occurred from 2012-2014. The best case (State level application of the Clean Power Plan) offers an export opportunity into New York and New England systems of another 691 megawatts on average, but that's little more than Ontario wasted in 2014 as generators reportedly curtailed an average of ~550 megawatts (by way of annual totals of 376 thousand MWh of wind, 1.2157 million MWh of nuclear and 3.2 million MWh of hydro-electric power). The NERC document that enthused Tyler Hamilton writing in the Star doesn't offer much hope for the U.S. northeast bailing Ontario out of its over-supply. The mid-continent system operator territory (MISO) may offer an opportunity. Michigan is Ontario's major contact point, but that state reports it "could be in full compliance with the new EPA requirements until between 2025 and 2028." MISO's reporting for the entire region provides more reason for optimism among those hoping demand for Ontario's electricity exports go up - along with some caution about the values, both monetary and in terms of health. States have two options on how their emissions cuts would be measured. If states choose the "rate-based" method, they would measure the rate that their existing generators emit, in tons/MWh generated, according to an EPA fact sheet. The other option would entail converting the rate-based goal to the tonnage they would be allowed to emit over a time period, known as the "mass-based" method. "Regionally, mass-based compliance is less expensive than rate-based compliance, with the gap increasing over time," according to a presentation by Jordan Bakke, MISO senior policy studies engineer. "Early compliance targets can be met through renewable portfolio standards and coal-to-gas redispatch, but comprehensive planning needs to start today to meet increasingly stringent compliance targets in the mid-2020s." To mitigate production cost increases, MISO would need new resources that severely cut or eliminate CO2 emissions, such as natural gas, wind and solar power, according to the presentation. Without such mitigating measures, under the mass-based method, the CO2 price would about double, from less than $20/[short ton] in 2022 to almost $40/[short ton] in 2030. Under the rate-based method, CO2 prices would range from about $17/st in 2022 to about $135/st in 2030. Ontario's feed-in tariff (FIT) offers for wind (all the projects coming online after 2012) were at $135 per megawatt-hour (MWh), upped from approximately $110/MWh in the previous Standard Offer Program. The increased cost to Ontario's ratepayers, over the lengths of the contracts, was recently estimated to have a net present value of $5.3 billion. It's expected to take most of a decade before the bonanza potential of selling low-carbon electricity will equal the unnecessary $25/MWh price bump that was gifted with the FIT program. Nonetheless, Ontario has contracted the unnecessary supply, and the value of that supply with Ontario is rapidly dropping. The imbalance of supply and demand grows with each new generator entering service, and very low natural gas prices add to the downward pressure on market pricing. Wind's intermittent nature result in lower market prices during windy periods,with that impact growing as wind capacity is added. 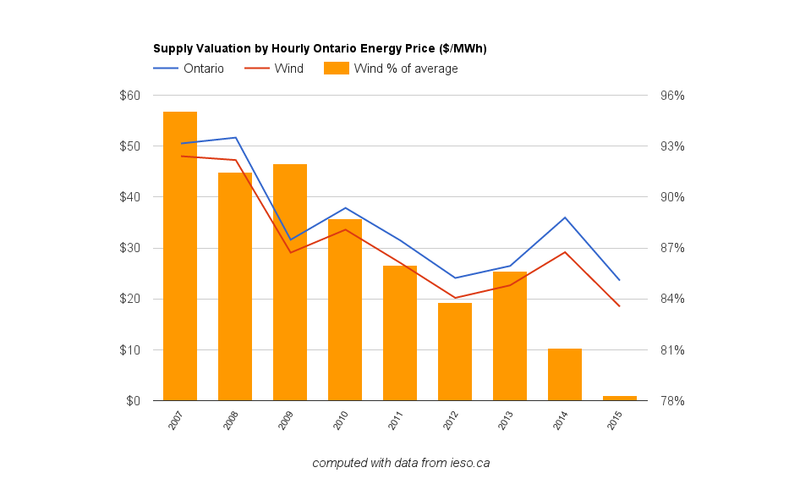 In 2015, the market value of Ontario's $135/MWh wind was below $20/MWh - less than the excess paid by jumping rates with the Green Energy Act. 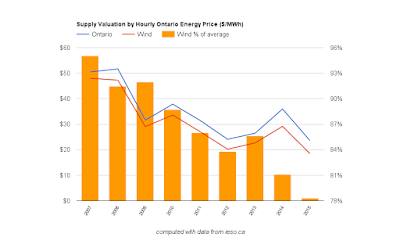 Over the past 3 months, all windy ones, the average Hourly Ontario Energy Price (HOEP) value of wind generation has been less than $10/MWh - or 1 cent per kilowatt-hour. For industrial wind turbines in the sector of Ontario's grid closest to Michigan, the value is lower than even wind's average. A power purchase agreement would be particularly useful for U.S. states in providing flexibility in choosing the path of reducing emissions intensity within their state, while still having utility if the overall emissions reduction is chosen. That flexibility has a value. Ontario can maximize revenues from the industrial wind generators "developed" after 2012 by finding states looking to reduce their emissions rate (the intensity option under the Clean Power Plan), and selling the feed-in tariff contract. The average power purchase agreement for wind in Michigan was estimated at $74.52/MWh in 2015 (see table 1). Existing Ontario contracts may not yield that high an amount, but with 1 US dollar currently worth $1.40 Canadian, Ontario's ratepayers could cut their losses far below the $115 level they experienced in 2015. The potential savings is immense- although the savings is only in the form of reduced losses. But there is also a cost. MISO suggests lower costs from "mass-based" compliance because, in part, it will allow more coal-fired power plants within MISO to run more often. For the same reason, Michigan should be interested in Ontario wind because it could reduce the need to replace coal-fired powered plants with natural gas-fired power plants. The same is true for Michigan's neighbouring states, all of which has significant coal-fire generation. There are costs to Ontario in selling of wind contracts to nearby US states. Two of Michigan's coal-fired power plants lie within kilometers of Ontario's shuttered Lambton coal-fired power plant, and those two Michigan plants have emitted more CO2 than all of Ontario's generators every year since 2008 - along with other emissions that are more of an immediate airshed health concern. Admitting the enormous losses on industrial wind may be hard for Ontario's government to swallow, and using American rules to facilitate the ongoing American use of coal may even make it hard for some Ontarians to breath. Nonetheless, Ontario can, and should, recognize air quality issues distinct from CO2 emission issues and rightly work to resolve health concerns separate from negotiating electricity contracts. Selling off the losing FIT contracts to the highest bidder is the right thing for over-supplied Ontario to do.